I've accepted the task of revamping this Chaos Lord for a Client. The thing is, the model is completely finished right now. I'm going to strip it down, rebuild it, do some conversion work and repaint him. This is how the model came to me. Like I said, finished. And he's a great looking model too. 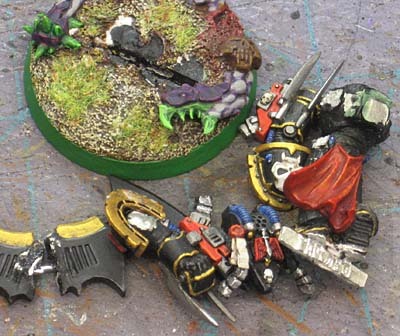 Nice conversion work, cleanly done and the paint job is perfectly fine. But we're looking for more. We're looking to bring this guy up to today's standards. We're going to give him a face lift as it were. New base, new paint job, some additional conversion work to finish him off and tie up some loose ends. We're going to make this guy a new man. 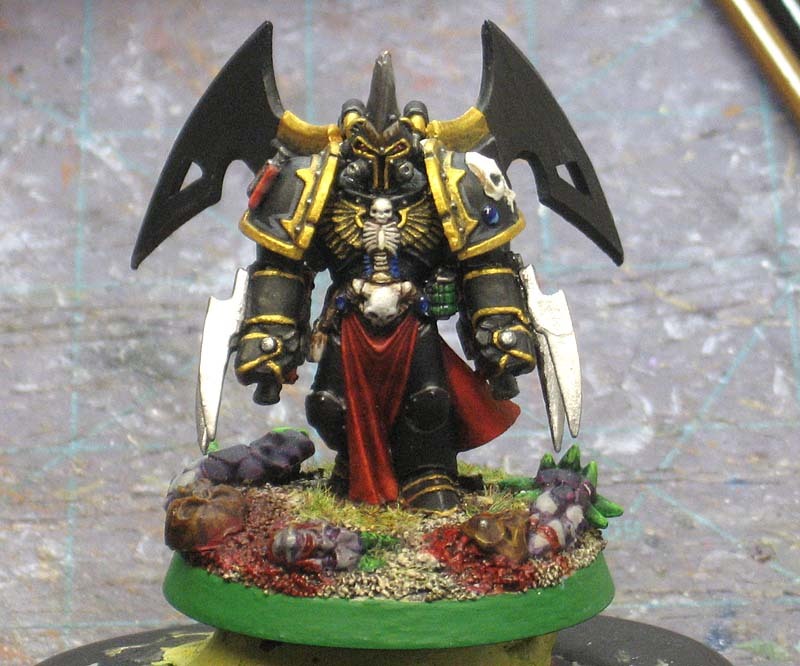 Here's the catch though... taking a model like this, that is already done, varnished and gaming ready and starting over can be a real challenge. I don't know exactly what I'm getting into in terms of actual model construction. I don't know how he's been assembled, what's been pinned, what's been greenstuffed, glued carefully in place or what kind of painting problems I'm going to get into. With a new model, you don't have these unknowns to deal with. Restoration is a whole new animal. So the first step is getting this guy taken apart. Sometimes, it's easy to tell where things come apart, other times... there's no way to tell. After that, it's time for a bath in the paint stripper. I use Dawn Power Dissolver when I need to strip paint. And here's where he stands right now. I've the main pieces cleaned and stripped. The pieces that are going to be replaced are here and ready to go (head, shoulder pads and backpack) and I'm getting some things together for a new base too. I'll be posting more on this guys as I make progress. Seems like it's going to be a very interesting article! I love doing this type of thing, so it's going to be interesting to see how you approach it. I noticed that you use Dawn Power dissolver for stripping. I use Simple Green. How do the two compare or have you ever used Simple Green? 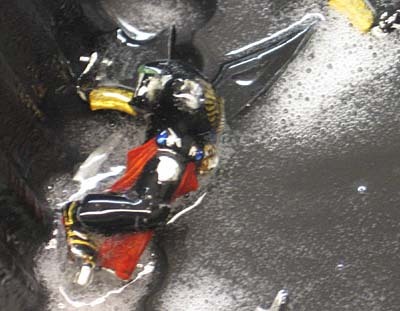 I have found that SG removes paint from metal models with contemptuous ease while plastic models are a totally different story. It simply won't remove everything there and is a bear to work with. How does Dawn measure up to these tasks? Dawn power dissolver works faster -- 20min soak vs overnight in my experience and it also works well with plastics. Wow I am going to have to try that next time I need to strip paint. Looks like a cool project, I'll definitely be following along..
Dave: The only time I've had trouble removing paint is on plastic and that's if the paint has been on there for 20 plus years. Dawn Power Dissolver works well on both (metal and plastic), no fumes, is not bad on your skin and can be used inside (so the Wife doesn't kill me) so it's a win in my book. A very cool original model. Curious to see how you change it, it will definitely be amazing. 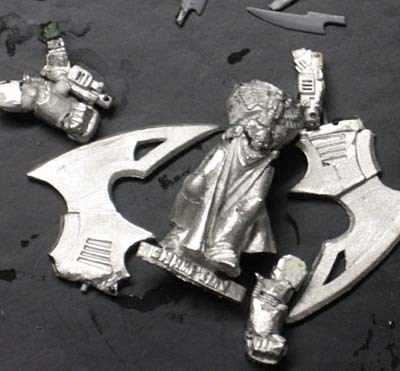 SAJ: I believe they are a set of the old metal terminator arms (thunderhammer and storm shield)with some serious conversion work done to them to get them to match. Excellent, can't wait to see this updated. Base def needed a brown edge or something. But, wasn't half a bad mini to start with tho! I'm curious to see how this all comes out - will you be updating this on your commission blog? Oh, absolutely. I'm in the middle of working on it right now and will be posting updates as I work on him for the next few weeks.